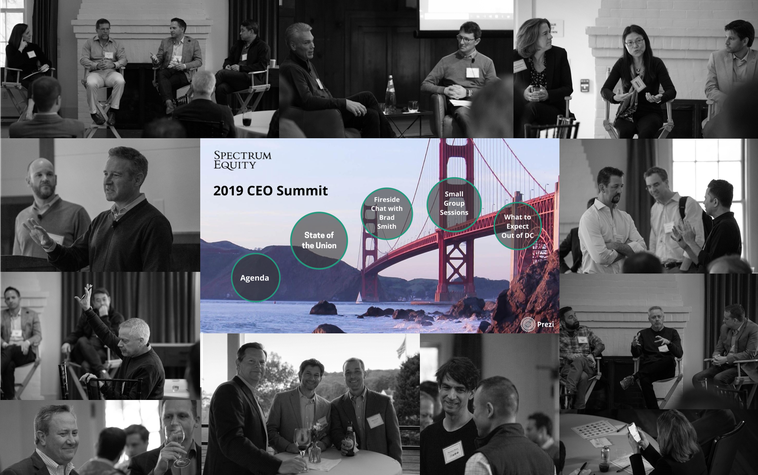 Last week in Sausalito, California, we hosted our annual CEO Summit for the leaders of Spectrum’s portfolio companies. The event brought together a group of executives and board members from 26 of our 30 companies, who had collectively traveled from 15 cities across three countries to be with us. As a sector-focused growth equity firm, we have invested in a portfolio of category-leading software and information businesses that share a high degree of commonality across the growth challenges they face. The CEO Summit provides a venue for leaders of these organizations to come together and learn from each other. We take great pride in the sense of community, common purpose and value in shared learning among the leaders of our portfolio companies. The Spectrum family has become a tight knit group who have learned from each other, and in many instances, sat on each other’s boards and invested in each other’s companies. We’re incredibly fortunate to work with this amazing group of companies and leaders.